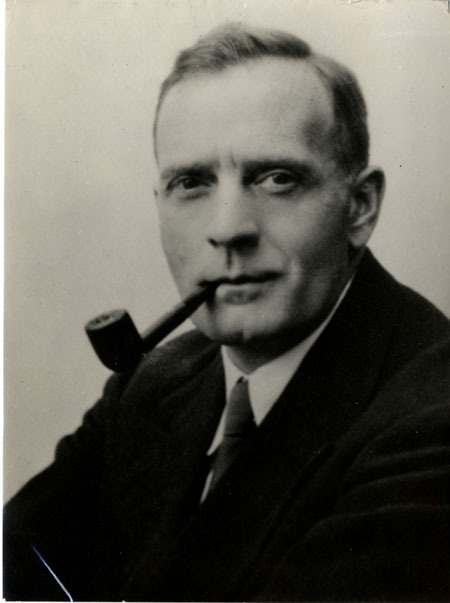 Edwin Hubble was born on November 20, 1889, in Marshfield, Missouri. Excelling at school and interested in many subjects, he received a scholarship to the University of Chicago. Upon graduating in 1910 with a degree in mathematics and astronomy; he decided to study law at Oxford University and then worked briefly as a lawyer in Kentucky. Quickly bored with law he returned to astronomy in 1914 when he joined the staff of Yerkes Observatory at the University of Chicago. In 1917 Hubble received a Ph.D. in astronomy from the University of Chicago for research on nebulae, a word then used to describe distant celestial objects not recognizable as stars (most nebulae were thought to be clouds of gas or dumps of stars). After serving in World War I Hubble joined the Mount Wilson Observatory in Pasadena, California, in 1919. The observatory housed a 100­inch telescope, then the largest in the world. In 1923 Hubble identified a Cepheid star (a pulsating star with a characteristic luminosity) in the Andromeda nebula. Using equations formulated by American astronomer Henrietta Leavitt, Hubble calculated the distance from Earth to the Andromeda Cepheid to be about 900,000 light years. It was known that our galaxy— which was thought to be the whole universe—was only about 100,000 light years across. Thus Hubble’s discovery, announced in 1924, showed that the universe is much larger than had been thought. Hubble’s extensive observations of nebulae also established that these mysterious objects were actually entire galaxies. In 1925 he introduced a classification plan for galaxies based on their shapes. Hubble then began to consider the work of American astronomers Vesto Slipher and Milton Humason, who had calculated the radial velocities of numerous galaxies (radial velocity is the rate of an objects movement away from or toward Earth). Analyzing their data Hubble noted a correlation between a galaxy’s distance from Earth and its radial velocity. In 1929 he proposed a mathematical relationship, now known as Hubble’s Law, stating that galaxies’ radial velocities increase the further away they get. This supported the theory that the universe is expanding. It also allowed a calculation of the age of the universe, which Hubble estimated to be about two billion years. In his later years Hubble wrote, lectured, served in World War II, and supported the development of the Mount Palomar Observatory in California. He died in San Marino, California, on September 28, 1953. Hubble’s discoveries overturned traditional astronomical ideas and provided foundations for the modern understanding of the universe’s size and age. Hubble’s calculation of the distance to the Andromeda galaxy dislodged the long ­held assumption that the universe extends only to ends of Earth’s galaxy (the Milky Way). This required a major perceptual shift as it suggested that the universe was billions of times larger than was previously assumed. The new understanding of the universe’s size launched an explosion of research aimed at discovering what lies beyond the Milky Way. It also led to speculations that if the universe is so immensely huge, it is possible that appropriate conditions for life exist in other galaxies. Hubbies Law represented the first coherent confirmation of the expanding ­universe theory In 1917 Dutch astronomer Willem de Sitter and Russian astronomer Aleksandr Friedmann devised a mathematical model of universe expansion. Their model attracted little support, but Hubble’s Law made it a basic element of the most widely accepted theories in cosmology (the study of the origin and structure of the universe). The Big Bang theory (as it came to be known), first proposed in the late 1920s, grew out of Hubble’s Law. It suggests that the universe began as a highly condensed point of matter that exploded, expanding outward and continuing to expand today. Hubble’s Law has also allowed continuously refined calculations of the age of the universe. The calculations rely on a number called the Hubble constant (part of Hubble’s Law), which is the ratio of the radial velocity of galaxies to their distance from Earth. Hubble’s calculation of this constant was higher than current research suggests, and estimate of the universe’s age was consequently two billion years, much smaller than the 12 to 20 billion years currently estimated. The National Aeronautics and Space Administration (NASA) launched a highly advanced telescope into space in 1990. In recognition of Hubble’s legacy, this outer space observatory was named the Hubble Space Telescope. While plagued with technical problems, which were fixed in December of 1993 on a mission of NASA’s space shuttle Endeavor, the telescope now sends images to NASA’s scientists, and continuously compiles further records of celestial phenomena, a mission Edwin Hubble would be proud of.